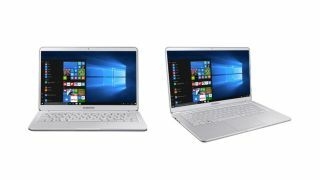 Samsung has added a 15-inch laptop to its family of ultraportable Notebook Series 9 models. Unveiled at CES 2017, the Notebook 9 15-inch retains the slim dimensions of previous laptops in the series while arriving with thin InfinityEdge-style bezels that place all of the attention on its capacious display. That display isn’t quite as high-resolution as what you would find on Dell’s equivalent laptop, the XPS 15, which sports a 4K panel. At Full HD, however, it should be more than adequate for getting work done. Keeping the pixel-resolution at 1080p should go some way to helping eke out maximum battery life, with Samsung claiming that the Notebook 9’s 66Wh battery can run for 15 hours on a single charge. The company reckons that it charges back up to full power in less than 2 hours, while 20 minutes connected to the mains will fetch you 3.5 hours of power. One of the Notebook 9’s most appealing characteristics is its weight of 2.73 pounds, making it much lighter than the 15-inch 2016 MacBook Pro 3.48 pounds, and even the 13-inch model (3 pounds). Inside is Intel’s 7th-generation Core i7 Kaby Lake processor, twinned with Nvidia’s 940MX graphics card - so you’ll be able to tear through Skyrim and Rocket League-type games at the very least. Other features include a fingerprint sensor for logging into Windows 10 with your desired digit, a USB Type-C connector, two USB 3.0 ports and one USB 2.0 port, and up to 16GB of DDR4 main memory. Samsung has yet to announce pricing and availability, so watch this space.